The most over-the-top decadent dessert ever!! 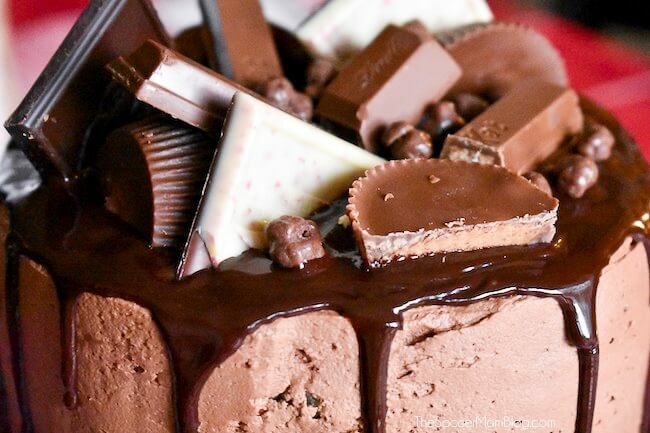 This Candy Bar Cake is a chocolate lover’s dream come true! 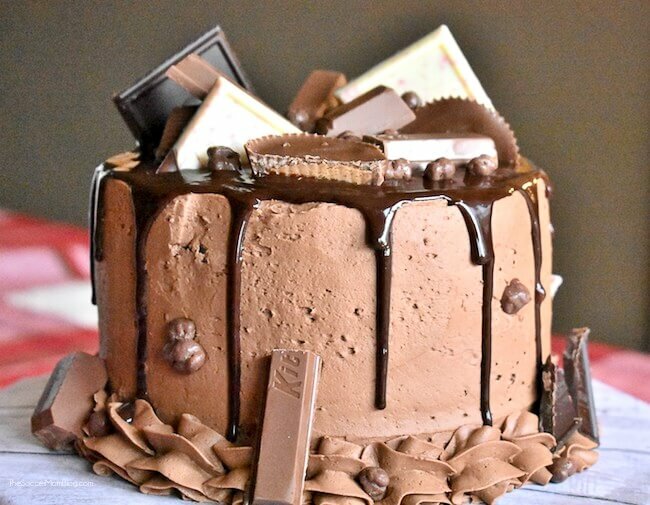 To say that I am a fan of chocolate cake would be an understatement! I think every single birthday cake I requested growing up involved chocolate in some fashion. That tradition still continues, as my husband bakes me a chocolate cake for every birthday too! He sure knows the way to my heart! 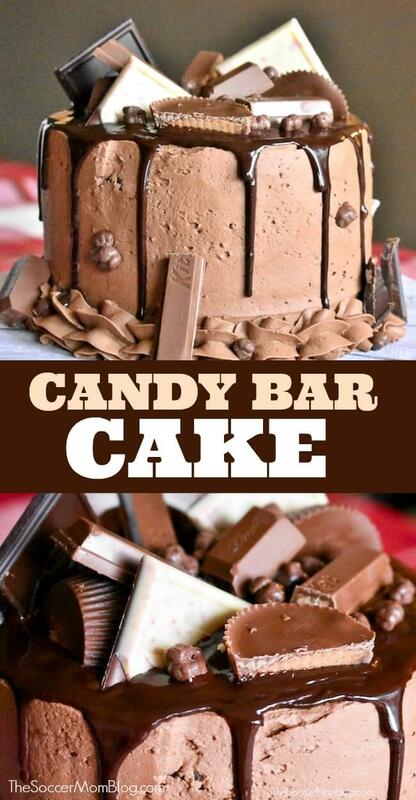 This candy bar cake is seriously the most chocolate in one dessert I’ve ever seen…and I love it!! 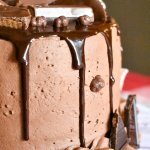 Keep reading for the full recipe – or combine the frosting and toppings here with my favorite Chocolate Mayonnaise Cake recipe! 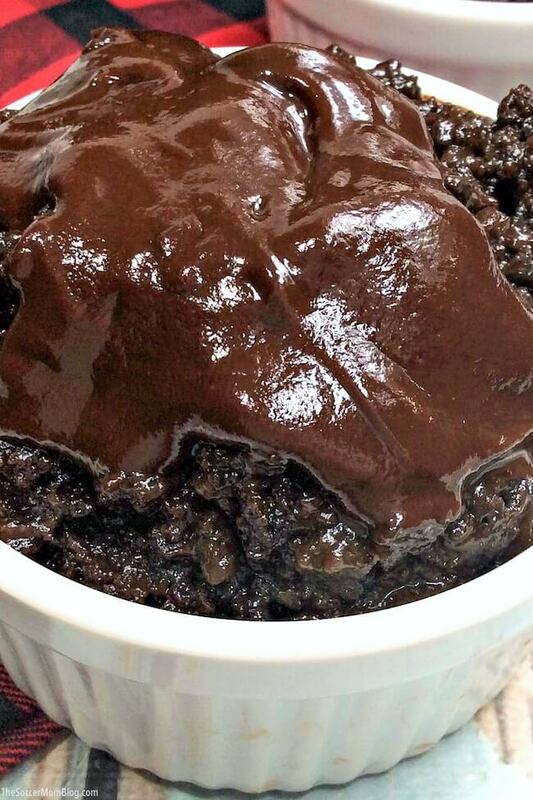 Make it gluten-free — Simply use a gluten free chocolate cake mix! Make it lactose free — Use your favorite non-dairy milk in place of the whole milk. We like cashew milk or coconut milk because of the rich flavor and creamy texture. Dark chocolate chips are naturally very low in lactose (and some are lactose free). You can also find dairy free chocolate chips in the natural food sections at many grocery stores. Customize your cake — Try different types of candy, sprinkles, anything you like! Preheat oven to 350°F and prepare three (6 inch) cake pans by spraying with non-stick spray. Add all of the dry ingredients into the bowl of a stand mixer with a whisk attachment. (You may also use a hand mixer). Whisk on high speed for about 1-2 minutes to remove clumps. Add in all wet ingredients, except the water, one at a time until well combined. Place your mixer on a slow speed and carefully pour in hot water. Slowly turn up the speed until you get back to the highest speed and mix on high for about 2 minutes. The mixture will be very watery and have bubbles. Pour your cake batter evenly into the three cake pans. Place on the middle shelf in your oven for about 30 minutes. After you can place a toothpick in the middle and it comes out clean, remove the cake from the oven and let cool for about 10 minutes. Placing your room temperature butter in the bowl of a stand mixer with a paddle attachment. Cream your butter for a good 2-3 minutes until it is light and fluffy. Add in your sifted powdered sugar and cocoa powder and begin to mix. Next add in your vanilla and whipping cream. I start out with 2 tbsp and if the mixture does not start coming together I will add in another Tablespoon. After all of the ingredients are well combined, mix on high speed for about 5 minutes. This will give your frosting a “whipped” texture. Add ½ -1 cup frosting in between cake layers and a generous layer on the outside. 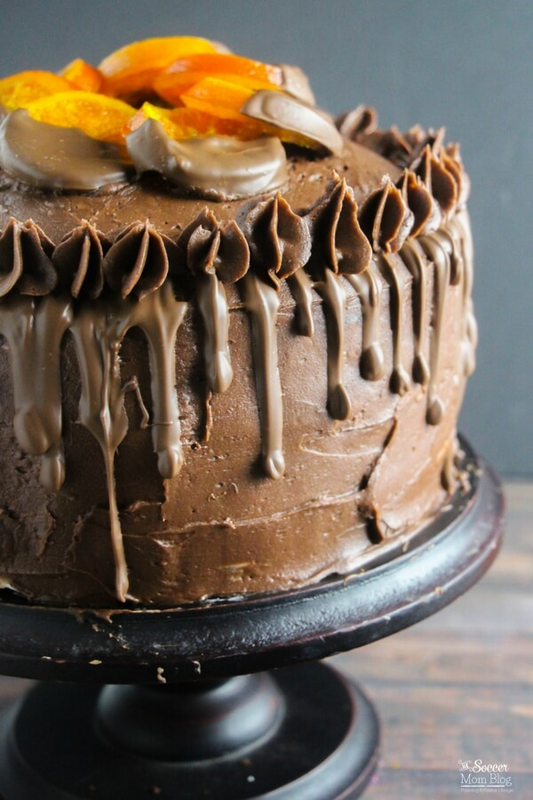 Place your frosted cake in the refrigerator and begin to make the ganache. Place your chocoalte and heavy cream into a microwave safe bowl, and place in the microwave for 30 seconds. Remove the bowl and allow to stand for one minute. Mix the chocolate and make sure all of it is melted before adding to your cake, you do not want chunks in your beautiful drip! If the chocolate is not melted completely, add back in for another 30 seconds. Once your cake is cooled, slowly and carefully add on the ganache with a spoon or a condiment bottle works nicely. 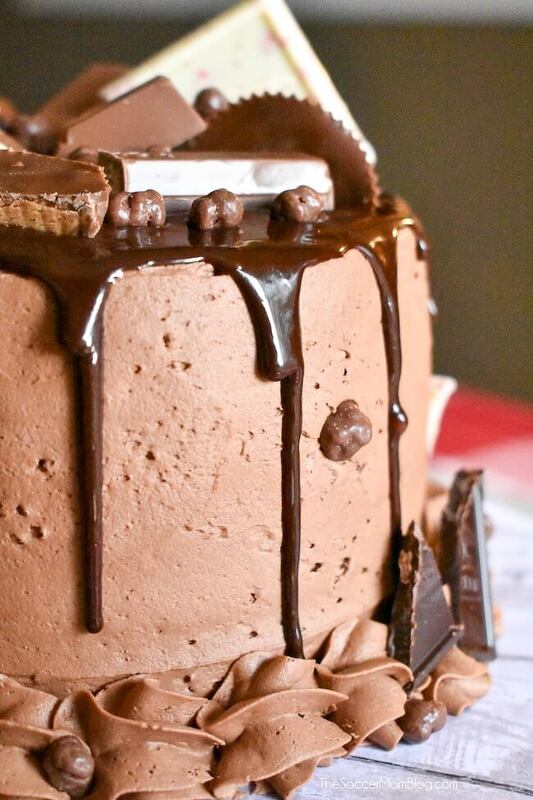 Slowly bring the chocolate to the side of the cake and allow drips to come down the side of your cake. Place your cake back into the fridge just long enough to cool the chocolate, but not let it harden completely. Add on your choice of chocolate bar toppings! This is my favorite part! Be creative! Note: Nutrition information is a rough estimate only; actual values will vary based on the exact ingredients used and amount of recipe prepared. Nutrition estimates do not include any candy toppings.